Love Varnish: Swatches & Review // Pahlish January Duo "Test Shaft 09"
Swatches & Review // Pahlish January Duo "Test Shaft 09"
Hi loves! Surprise surprise, a Saturday post! I just had to share these swatches with you because this little set is releasing tomorrow, and I wanted to make sure you could see my swatches in time ^^. This is the new duo from Pahlish called Test Shaft 09, and as usual it consists of both a base polish and a topper. I did my best to get these swatches as accurate as possible, but since the base is an atomic coral cream, you might understand it was quite tricky ;-). Pahlish Zulu Bunsen is the base of the duo and it's an atomic coral cream. Coral shades usually pull quite orange on me so that's what my camera pulled up more as well. If you check other swatches, like Very Emily, Ida Nails It, Pointless Cafe and @mcpolish, you can see more of the pinkness to it. The formula is good, it's one of those colors where it's both pigmented and slightly sheer at the same time. I used 3 thin coats for opacity and topped with top coat since it dried a bit flat on me. It also dries a tint darker compared to when you brush it on. Pahlish Moon Rock Dust is the topper of the duo and it's a clear topper with a mix of holographic, platinum, and gold flakes with iridescent orange and purple glitters and violet shimmer. This one is formulated a bit more sparse than I am used to from Pahlish, but that's okay. Since it goes on easily and smooth you could always add a second layer or sponge on a gradient. The way it looks against that bright base,,, perfect! Like I always, Pahlish puts out a fun and pretty duo, and this bright shade will surely shake up those dreary January days. The topper is very versatile I think (it looks gorgeous over darks, too) and that creamy base is just a perfect Summer pedi color! What do you think of this month's duo? See anything you like? Tell me in the comments! 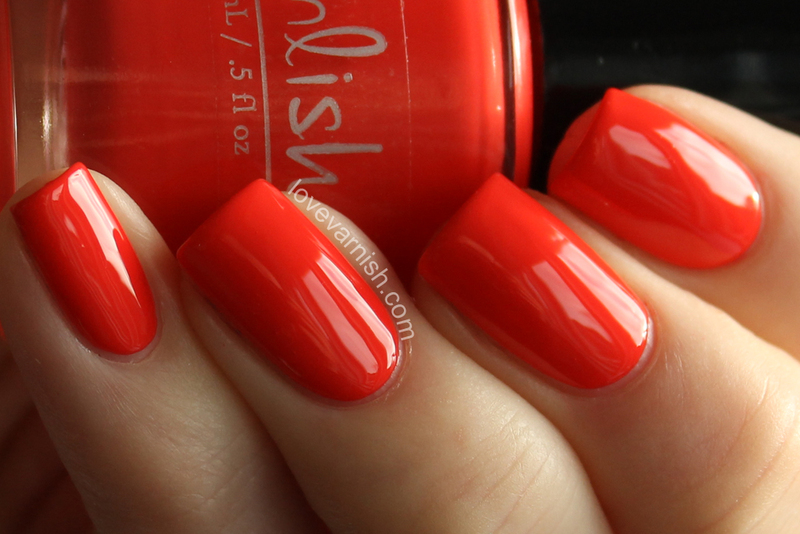 Pahlish is a US based indie with regular restocks and reasonable international shipping rates. You can find more info in the webshop! The January Duo Test Shaft 09 is releasing Sunday January 10. Make sure to check the Facebook page linked below, as releases and restocks are announced here.